Tens of thousands have gathered in Barcelona for a candlelit protest after two leaders of the Catalan separatist movement were jailed. Jordi Sánchez and Jordi Cuixart are being held without bail while they are under investigation for sedition. The men were leading figures in the disputed 1 October independence vote, which Madrid has branded illegal. Spain's Constitutional Court appeared to back central government's position on Tuesday, ruling the vote void. It had initially suspended the law used by Catalan authorities to call the referendum. However, Catalan government spokesman Jordi Turull suggested neither the court decision nor the imprisonment of Mr Sánchez and Mr Cuixart was going to stop the drive for independence, telling reporters "surrender is not something this government is considering". 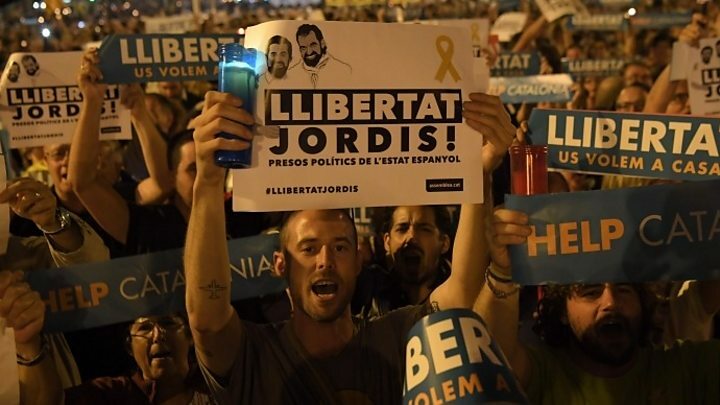 The air of defiance carried into Tuesday evening, when separatists carrying candles and chanting "We're all Jordis" gathered in Barcelona's Plaza Constitució protesting Mr Sánchez and Mr Cuixart's imprisonment - a move which many on the pro-independence side see as politically motivated. 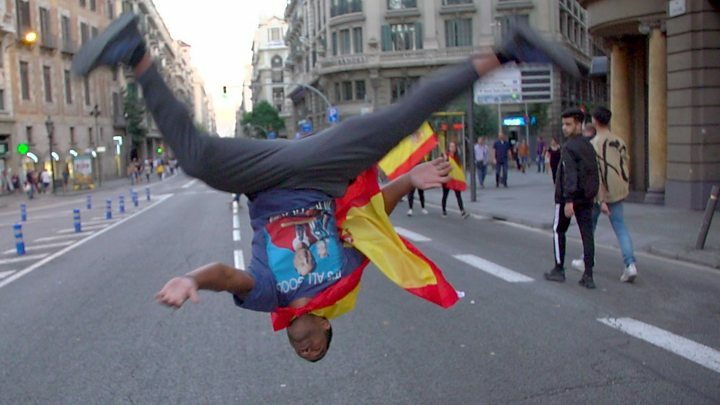 The city's municipal police estimated the number of people in Barcelona to be around 200,000, while protests also took place in other Catalan cities, including Girona and Reus. Catalan leader Carles Puigdemont has already signed a declaration of independence, but halted its implementation to allow negotiations as he called for talks to take place over the next two months. The position still stands, Mr Turull said. But the Spanish government has warned that Catalonia must revoke the declaration or face direct rule from Madrid. Mr Puigdemont has also angered Madrid by refusing to clarify whether or not he declared independence last week. He has until Thursday to clarify his position. "I don't know what will happen," one pro-independence campaigner told me during a small demonstration at midday. "Perhaps Spain will send in tanks," he said, only half-jokingly. No-one here seriously expects that to happen. But many are unsure as to what comes next. Pro-independence groups have been angered by the Spanish High Court's decision to remand into custody two prominent campaigners, Jordi Sanchez and Jordi Cuixart. "They are our first political prisoners," one man told me. In the centre of Barcelona, normal life continues. Outside the Catalan regional government headquarters, groups of tourists find themselves sidestepping camera crews. Many residents in the city still display independence flags from their balconies. All await Thursday morning's deadline. The smaller march saw thousands blocking the streets, chanting "repression is not the solution". The men are being investigated over a protest on 20 September in which a crowd blocked Civil Guard officers inside a building in Barcelona, Catalonia's regional capital. Barcelona Mayor Ada Colau - who does not support the current bid for Catalan independence - said they were being held as "political prisoners". Mr Puigdemont had also said the jailing of the men, known fondly as "the two Jordis", was like having "political prisoners again", a nod to the days when Catalan culture was systematically suppressed under Francisco Franco. Spanish Justice Minister Rafael Catala dismissed the allegations, however, saying it was purely a judicial decision. "These are not political prisoners because yesterday's prison ruling was due to a [suspected] crime," he said.